Publication Information: Random House. 2017. 320 pages. Opening Sentence: "I went to the Mississippi Delta with a specific project: to teach American history through black literature." Favorite Quote: "The idea that you can change somebody's life for the better is powerful. It looms, in particular, over the debate about teachers. Are they good or bad, cheats or saints, unfairly demonized or blindly exalted? Underpinning these opposed portraits is the debate over the nature of the student. One side of the argument claims the student is an impressionable blank slate, a tabula rasa onto which teachers - if they're good enough, smart enough, and they care enough - can effectively imprint their passions and knowledge. The other side argues that the student is already permanently formed by his conditions - by violence, by neglect, by poverty. No teacher can change his life. Neither side can be completely true. " Here is the story summarized. Michelle Kuo, the daughter of first generation Taiwanese immigrants, grows up in relative security and prosperity. The family focuses on education and solid careers. Ms. Kuo graduates from Harvard and is unsure of the path she wants to take. While figuring things out, she joins the Teach for America program and is sent to a school in Helena, Arkansas. There, she encounters one of poorest communities in the country. It is a community that is ridden with poverty, crime, and racial divides. She teaches for two years and then leaves to pursue law school and her own life forward. Knowledge that one of her students stands accused of killing someone brings her back to Arkansas while he awaits trial. That is the time spent "reading with Patrick." What I appreciate about this book is that it talks about what is so often not talked about in the United States - the poverty, the racial divide, and the inequity in the justice system. These are the issues so thoughtfully and poignantly dealt with in books such as Men We Reaped by Jesmyn Ward and Just Mercy by Bryan Stevenson. This book most reminds me of An Invisible Thread, which is also a story of an unlikely connection between people and the impact it can have. I began this book prepared to love it and prepared to be moved by it. Unfortunately, for several reasons, this book was not for me. 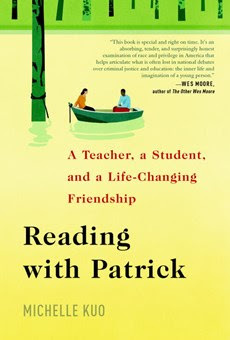 Reading with Patrick has very little about reading or about Patrick. This book is very much Michelle Kuo's story. It speaks to her immigrant background, family concerns, and cultural expectations. Those all come into play as many who surround her do not understand her choice to teach. This book is about a young woman finding herself independent of family; her journey happens to intersect with this community and this young man. She comes as and remains an outsider to the community in Helena, Arkansas. It speaks about the poverty, crime, and racial divides in Helena, Arkansas but as it touches her life and not as a social commentary. Then, the page turns, and her journey continues without them. Michelle Kuo's journey is an interesting one as it mirrors the path of many young people, but just not the one I was expecting. The subtitle of this book also uses the term life-changing friendship, but from reading the book, friendship is not what comes across. Pity perhaps. Guilt at a secure, prosperous life perhaps. A momentary connection but not friendship. This thought is reinforced by a little research on the background of this book. Very little is found about Patrick, but much can be read about Michelle Kuo. In fact, the base of this book can be found in a 2009 article in the New York Times Sunday Magazine. The book acknowledges that the initial article was written without permission from Patrick and even without his knowledge. I leave this book wondering what was Patrick's story and what happened to Patrick and how Patrick's life changed because Michelle Kuo was a part of it for a time.